I nearly completely forgot to write this post as brushing your teeth is something you do automatically each day without thinking about it too much. I've always had sensitive teeth but for some reason have never really considered trying products designed to try and tackle sensitive teeth, maybe because mum buys our toothpaste so I just use what she buys. If you suffer from sensitive teeth you'll know many things can set them off, cold food or drinks, the water spray at the dentist, even just a cold wind and when they do play up it can be really quite painful. Sometimes there doesn't even need to be something (that I'm aware of anyway) to set mine off, they just kind of ache and even breathing through my mouth can be sore. 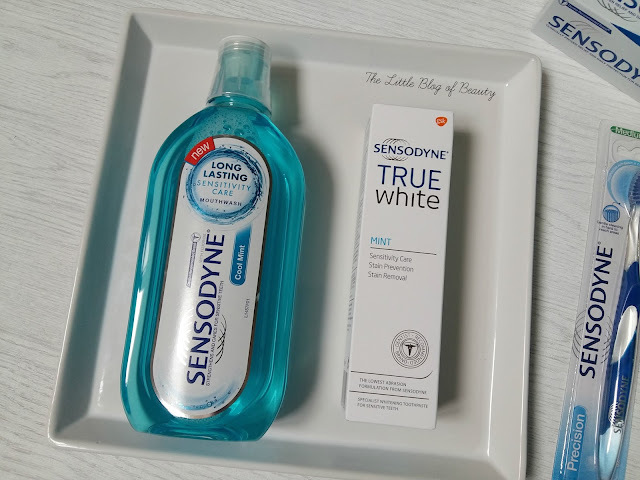 When I was offered a sensitivity SOS package from Sensodyne to try I thought it was a good opportunity to finally try some products designed to help tackle sensitivity. I was sent the new Sensodyne mouthwash in cool mint*, Sensodyne Repair & Protect toothpaste*, Sensodyne True white toothpaste* and a Sensodyne Precision medium toothbrush*. Although I'm aware that toothbrushes come in different levels of hardness I've never really considered what level I should be using. As I do have sensitive teeth I should really be using a softer brush as it will be kinder on my teeth and gums. 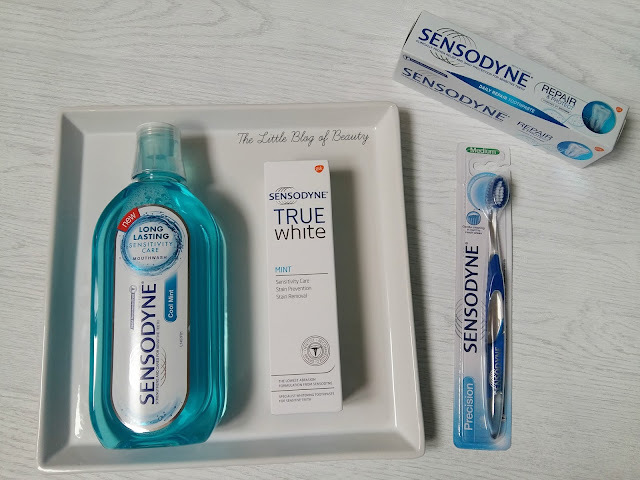 When I first started using the Sensodyne Precision toothbrush I was surprised by how much softer it was than the toothbrushes I've used in the past. As we all know you should really replace you're toothbrush every three months but using this toothbrush has shown me that I do brush too hard because this one needed replacing much sooner than that. The softer brush felt much more gentle on my gums and even though I was obviously brushing too hard I experienced much less bleeding than I normally do. While using this toothbrush I had a check up at the dentist and was pleased to be told that my teeth didn't need to be cleaned, that's only happened once before, so I think I've been doing a pretty good job of cleaning my teeth using this brush. I've now bought a new softer brush and I'm trying to remember not to brush too hard. Although my teeth aren't too bad I have recently been thinking that I would like them a little whiter. I'm not talking Simon Cowel, Tom Cruise or Rylan levels here, just a little whiter than they are currently. Although I've never really thought about whitening methods before thinking about it now I guess they could possibly be a little harsh if you have sensitive teeth. So I was pleased to see a sensitive whitening toothpaste had been included in my sensitivity SOS package. This is designed for stain prevention and removal but also to provide sensitivity care and to be low abrasion. This doesn't quite feel like a standard toothpaste, it's thinner and doesn't appear to foam as much, but you do get used to it. As this is low abrasion I'm guessing it might not be as effective as other methods of teeth whitening but I was pleased to see a slight improvement in the whiteness of my teeth. As the name suggest the Repair & Protect toothpaste is designed to continuously repair and strengthen vulnerable areas and protect your teeth. I still have some of the True white toothpaste left but I've worked my way through the whole tube of Repair & Protect and I did notice an improvement in my sensitivity. It didn't disappear completely, but it was improved and I would imagine this is a product you should really use continuously and long term to keep seeing an improvement and to keep up the effect that it has. I do like to use mouthwash at least once a day but my dad keeps putting the bottle in the bathroom cabinet and because I don't see it I forget to use it, so I haven't used it regularly for quite a while now. I've made sure to use this daily in the morning with the Repair & Protect toothpaste and because I've used the two together I don't think I can comment on this as a product on it's own with regard to sensitivity. I do like it as a mouthwash though. It leaves my mouth feeling really clean and fresh, like I've just had a clean at the dentist, but as with all mouthwashes it can get a little strong the longer you keep swilling it around. I enjoyed using all of these products and I'd definitely consider buying them in the future. The mouthwash is £4.99, the toothbrush £3.60 and the toothpastes £4.49 each and all are available at Boots.